Artist Julia Bottoms-Douglas paints Eva Doyle. The NFTA and the Albright-Knox Art Gallery partnered to create the Freedom Wall. 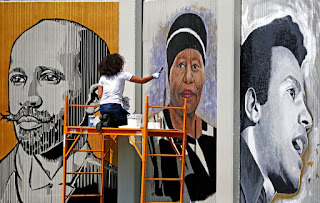 Located on the city of Buffalo’s East side at Ferry and Michigan Avenue, the Wall is a mural featuring the portraits of 28 civil rights leaders, both local and national and runs the length of our Cold Spring bus garage. The installation comprises the work of four Buffalo artists: John Baker, Julia Bottoms-Douglas, Chuck Tingley, Edreys Wajed. They have all been at the canvas since the beginning of the summer, but still have a few weeks to go before completion. The wall is 300-feet long and more than 10-feet tall. 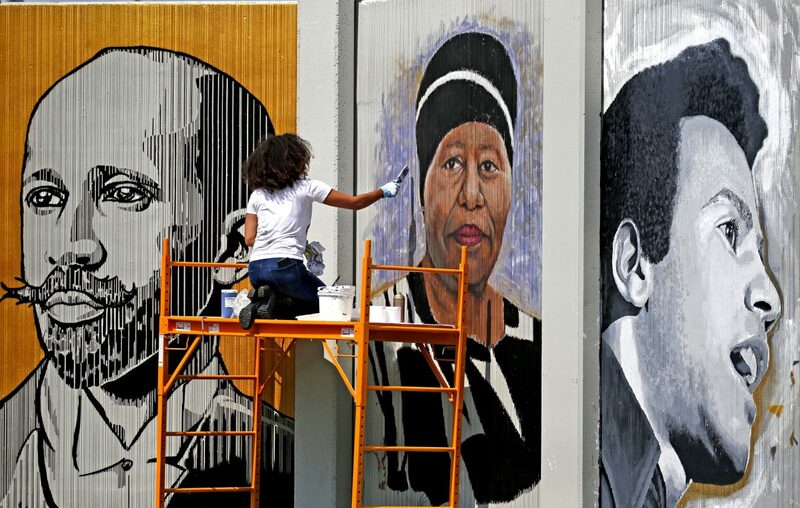 Mural subjects include Mary B. Talbert, Shirley Chisholm, Frank Merriweather, Dr. Martin Luther King, Jr. and Buffalo’s own George K. Arthur and William Welles Brown.